Can GPC/SEC determine if my sample is branched? While talking to customers about their samples, a frequent topic that comes up is whether or not their samples are branched. Fortunately, I work primarily with Malvern Panalytical’s gel permeation / size exclusion chromatography (GPC/SEC) product range, which in addition to providing molecular weight, intrinsic viscosity (IV), and hydrodynamic radius (Rh) data, offers the ideal technique to observe, and even quantify, the extent of branching within a sample. 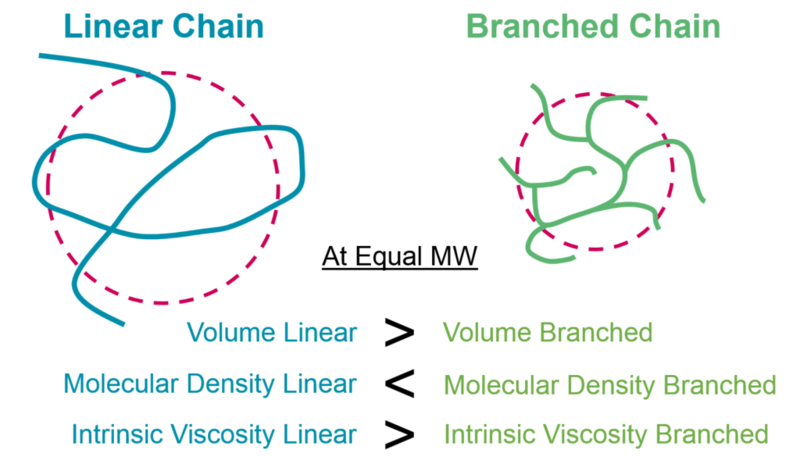 In this post, I’m going to describe what it means for a sample to be branched, how branching affects a sample’s molecular structure, and how GPC/SEC can be used to measure branching. 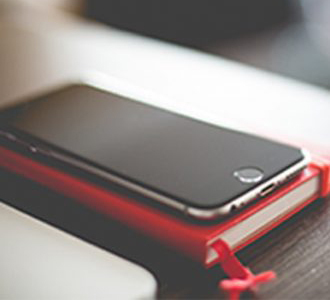 Let’s begin by defining what it means for a sample to be branched or to exhibit branching. A branch point in a polymer is a trifunctional (or greater) point where a secondary chain has propagated from the primary, linear backbone of the molecule. From a practical standpoint, this means that on a material level the polymer chains within a sample are unable to pack as tightly, which often results in stretchy or flexible end-use materials. Some materials are designed to be consistently branched (think of the molecule shaped like a comb), some randomly branched, while others end up branched as an unintentional result of the polymerization event. Whether intentional or not, observing and potentially quantifying branching within a sample is a key part of complete characterization. In addition to making it difficult for polymer chains to pack together, branching affects the structure of a single polymer chain by making it more dense. This may be counterintuitive considering that branching typically results in the final product being more flexible, or less dense, but on a molecular level a branch point increases the amount of mass in a given volume, thus increasing the molecular density. The figure below depicts two polymer chains with equal mass, one linear and one branched. The volume occupied by the branched chain is less than that of the linear chain, resulting in a higher molecular density for the branched chain. This difference in molecular density between a linear and branched sample is what allows branching to be observed. As indicated by the bottom line in the above figure, the difference in molecular density generated from branching manifests itself as a difference in measured IV. The units of IV are dL/g, or volume per mass, and represents an inverse density figure. This inverse relationship is why the molecular density increases with branching, whereas the IV decreases. Needless to say, the presence of a viscometer detector in a GPC/SEC system is critical for observing and characterizing branching within samples. The best way to study a sample’s molecular structure is through the Mark-Houwink (MH) plot, which plots a sample’s IV on the y-axis against its molecular weight on the x-axis. Polymers with consistent structures throughout their molecular weight range have MH plots that appear as straight lines, as their molecular size, and thus IV, increases at a consistent rate with increasing molecular weight. Samples with similar structures will have MH plots that overlay or exist along the same line. Samples with different molecular densities will appear “stacked,” with the densest material situated lowest in the plot. If a material is branched, its MH plot will appear to curve downward with increasing molecular weight, as compared to a linear analogue. This is illustrated in the figure below, where the red and purple lines represent a linear sample and the curved lines represent a variety of branched samples. The reason branched samples appear curved is because of the branch points, which increase the molecular density. Since molecular density and intrinsic viscosity are inversely related, when the molecular density increases at a given molecular weight, the intrinsic viscosity decreases. 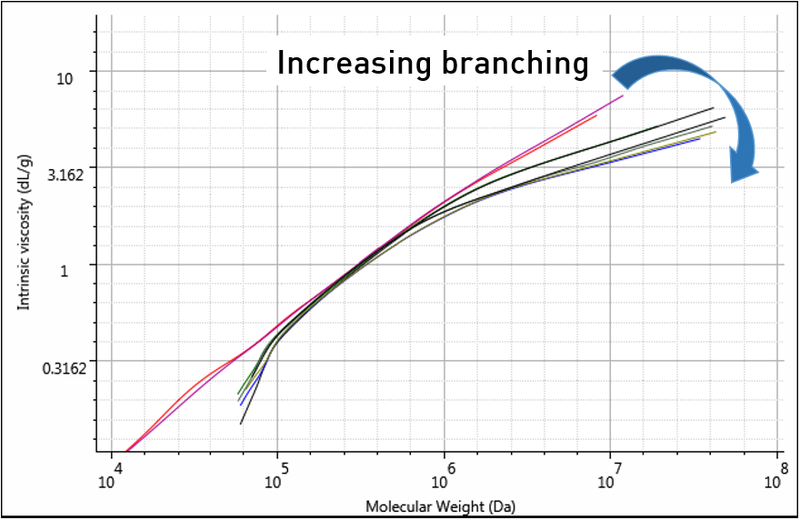 As the plot moves along the x-axis to the right, the molecular weight of the sample increases, which means there are more opportunities for branch points, and so the differences between linear and branched samples grows with increasing molecular weight. This difference between the plots for the linear and branched samples provides the basis for branching calculations. These plots show examples of long-chain branching, in which the branching increases along with molecular weight. A Mark-Houwink plot of a sample exhibiting short-chain branching, where the molecule possesses regular, short branches consistently present throughout its structure, would look more like the stacked plots described above. An example of this would be the differences between polyethylene and polypropylene, shown below, in which both samples have an identical saturated hydrocarbon backbone, but the polypropylene sample has a methyl substituent on every other carbon. In this case the molecular density of polypropylene is greater than that of polyethylene, but the amount of branching does not increase with molecular weight, as the length of each branch remains the same regardless of molecular weight. The differences between polyethylene and polypropylene are typically described as arising from differences in molecular structure, not due to branching. Malvern Panalytical’s OmniSEC software is designed to calculate long chain branching using the three most common Zimm-Stockmayer equations for branching. These models compare the IV of a linear reference and branched sample at each molecular weight. If a linear reference, such as the black plot in the figure below, is not available, then the user can generate one by entering the appropriate MH parameters a and log K or by using the lower molecular weight, linear region of a sample’s MH plot to approximate its trajectory. 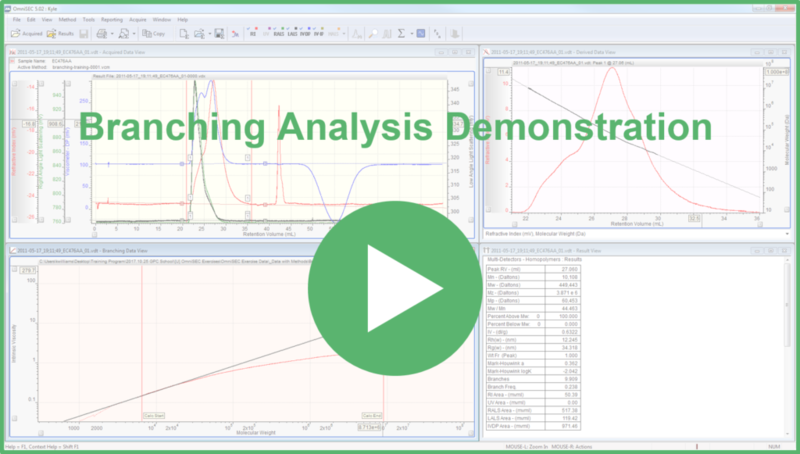 A video demonstration of the branching analysis method, including demo data with which you can practice, can be found by clicking here and on the image below. Calculated data available from this type of analysis includes branching number (Bn), or average number of branches per chain, and branching frequency (λ). These pieces of data, along with the MH parameters a and log K, provide detailed insight into the molecular structure of a sample. The best part is that all of this data can be obtained from a single injection of a sample on a multidetector GPC/SEC instrument! What is a dn/dc value and why is it important for GPC/SEC? 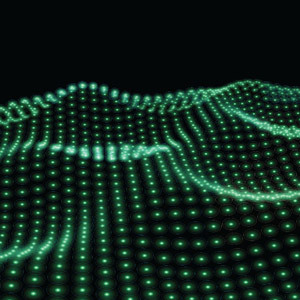 Which light scattering detector is best for me?